Friday marked the five-year anniversary of one of the greatest days in the history of local football. Hastings United took on the might of Championship club Middlesbrough at The Riverside Stadium in the third round proper of the FA Cup. Then Hastings player-manager Sean Ray acknowledges the club's fans at The Riverside Stadium. Hastings, then of the Ryman League Premier Division, lost the game 4-1, but gave their 1,068 travelling supporters plenty to shout about with a whole-hearted display which was capped by a wonderful goal from Bradley Goldberg. Playing against a club 131 places above them in the football pyramid, Hastings trailed to a 22nd minute goal from Moroccan international Merouane Zemmama, who picked out the top corner from 25 yards, at half time. Prior to that, Liam O’Brien, making his debut in the Hastings goal with Matt Armstrong-Ford injured, saved an Ishmael Miller penalty. O’Brien, incidentally, was part of the Coventry City side which upset Stoke City in the same competition yesterday (Saturday). Andy Halliday made it 2-0 with a close range finish following a corner less than two minutes after half time and Zemmama grabbed his second in the 68th minute with a deflected shot from outside the box. Some 1,068 Hastings United supporters enjoyed a memorable day on Teesside. Right from the restart came the moment which will live long in the memories of all the Hastings supporters who witnessed it. Goldberg controlled the ball well and ran at the Boro defence before unleashing a stunning 25-yard strike into the top corner, sparking joyous scenes among the players and supporters behind the goal. Miller completed the scoring with Boro’s fourth goal in the 85th minute, rolling a precise shot into the bottom corner from the edge of the D.
Other notable moments for Hastings included Goldberg having a first half goal disallowed for offside and Lee Carey’s terrific 25-yard shot in the second half being fingertipped onto the post by Boro goalkeeper Jason Steele diving to his right. Hastings: O’Brien, Cox (Manning 72), Whitehead, Carey, Ray, Jirbandey, Dixon (Okojie 77), Camara, Goldberg, Crellin, Vickers (Ellis 52). Subs not used: Howard, Daly, Richardson, Abbott. Attendance: 12,579. Bradley Goldberg celebrates in front of the Hastings United supporters after scoring his wonder goal. Led by player-manager Sean Ray, the Hastings team that day contained two players currently at the club - Jack Dixon and Tom Vickers - plus one who started the season at The Pilot Field in Carey. Reaching the third round proper was an extraordinary achievement for Hastings, who had come through six rounds to get there. In December 2012 they beat Harrogate Town on penalties in a second round replay televised live on ESPN watched by a sell-out 4,028 crowd at The Pilot Field. At the time all connected hoped that the cup run, and the significant funds it generated, would be the springboard for the club to push on higher up the non-league ranks. 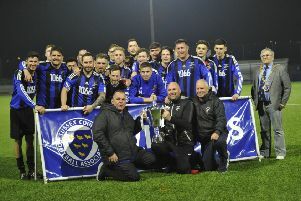 But hampered by a long-term injury to star striker Goldberg and a punishing fixture backlog, Hastings were relegated from the Ryman Premier at the end of that rollercoaster season. Despite reaching the play-offs in the 2013/14 campaign and again last term, Hastings are still playing one level further down in what’s now known as Bostik League Division One South. And in present boss Chris Agutter, Hastings are now on their eighth permanent manager since the resignation of Ray in August 2013.